Parking continues to be restricted within construction areas but otherwise available to use. Parking restrictions will be put into place between 38th and 50thStreets on or after April 8. Please adhere to no parking signage where posted. A short-term closure (2-3 hours) of one northbound lane of College Ave will be necessary to set the station structure at 66th Street. This work will take place outside of the morning and evening rush hours on or after April 19. Drivers should expect temporary lane restrictions at localized work areas. Construction will begin on bus pads on or after April 15. During the week of April 22, segments of Capitol Ave immediately adjacent to the stations will be reduced to a single lane to accommodate this work. This work will occur outside of the morning rush hour. Short-term closures of one lane of Capitol Avenue will be necessary to set station structures (3-4 hours at each station). This work will take place outside of the morning and evening rush hours over the next three weeks. Pavement patching will be occurring at locations along Meridian Street beginning April 29. Night work will begin on or after April 22 for bus pad construction starting at the 18th Street intersection and proceeding North to 38th Street. Each station area and adjacent intersection will be closed overnight but open from 7:00am to 9:00pm. Work will last approximately 1 week with no weekend closures to take place. A section of Shelby Street is closed just south of Pleasant Run Parkway South to facilitate construction of bus pads. Work will be completed and Shelby St will be reopened to traffic by April 22. Station platform work along Shelby will necessitate closing one lane of Shelby for up to two hours at each station location. Flaggers will be used to facilitate through traffic during this short-term closure. This work will begin on or after April 15 at Hanna Avenue, continuing north. 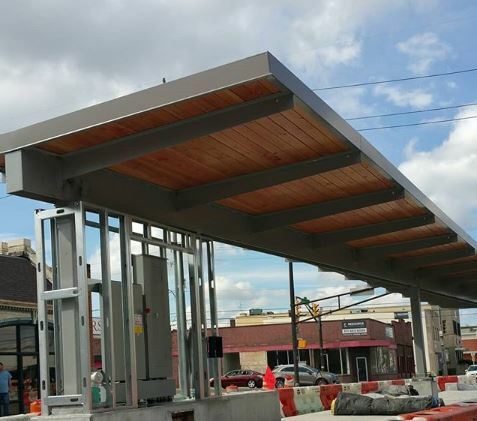 Interesting that the design of the stations on Shelby Street will result in the buses blocking all traffic for as long as they are at the station. I would’ve thought it would have been possible to design it so the buses would not block the single lane of traffic for loading/unloading. I understand that they expect to have relatively quick boarding and alighting with fares already paid, but it can still take awhile, especially if you have elderly, small children, folks in wheelchairs, etc. I’m also curious what the waiting experience will be like at the station when you’re standing right next to a travel lane. I’m sure the existing right-of-way is limited at some of these locations, but would think that wouldn’t be insurmountable. I can’t recall ever seeing a bus station where the bus blocks the only lane of traffic while at the station. And then, on the other end of the spectrum, you have the ridiculously wide intersection of Shelby & Raymond actually being widened. So, that should be a great enticement to walk and use transit there. Not. I see that the three stations on Virginia Avenue will all block traffic as well. It will be interesting to see how drivers take to that, and whether passing buses in the oncoming lane, when possible, will become a common occurrence. I don’t think that’s correct about Shelby and Raymond. I uploaded the project preview along with the current layout here. Looks like the north side’s curb has bumped down farther, and has tighter turning radii. The south side looks basically unchanged. Thanks for posting that. It’s still a bit confusing, because the purple shading is indicated in IndyGo’s key as “Pavement Widening”, which makes it appear that they are increasing the size of the intersection in all four quadrants. They are at least moving the north side crosswalk back out of the intersection, which would be a solid improvement. The question for IndyGo and DPW is why can’t see the wisdom and need to do that for the other crosswalks on the east and south side. The crosswalk distance appears to be about 75% longer on the south side of intersection. I’m guessing it’s probably about 50 feet on the north side, ~80′ on the south side, and ~100′ on the east side. I don’t see a lot of “by choice” riders choosing to walk across that intersection. I guess it might work for people coming from the west side of Shelby, because they can avoid the east and south crossings, and maybe we don’t really expect anyone to cross under I-65 to come from the east. Red Line or not though, the City ought to be able to make that entire intersection safer for pedestrians. Since it is adjacent to 65, I think INDOT unfortunately has a lot of say for how much traffic capacity they require. I hate the 65 and 29th/30th interchange because of the terrible pedestrian experience around there, but I doubt that kind of stuff can change without INDOT say so. Are all these roads impacted also going to get repaved? Our tires can only hope so. Based on what I have seen at the north end of the line (between Broad Ripple Avenue and 65th Street), it appears the paving is restricted to only those sections of the street that were excavated – i.e., ot the entire street. It depends on the location and pavement condition. In some places, the entire street will be resurfaced and in other cases it may be spot resurfacing depending on degradation of the surface and subgrade. I would certainly hope that they would take this opportunity to completely repave the entire streets and not just to spot patching. If not, OMG – how incredibly stupid. 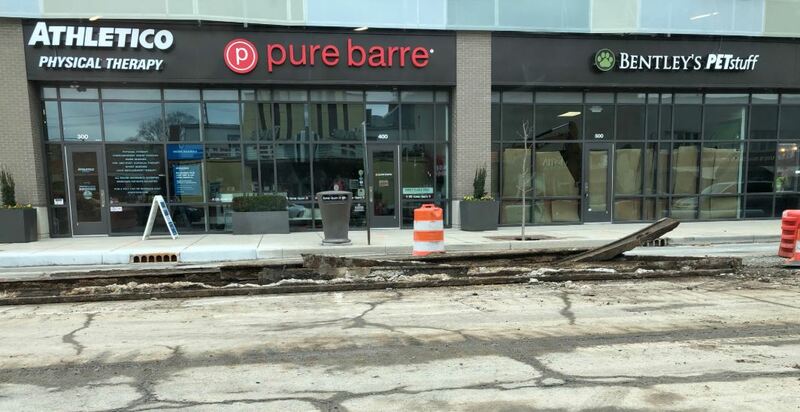 I naively hoped that the “paving” over the excavated portions of the street was just a temporary fix while construction is ongoing and that it would be properly paved at the conclusion of construction. As it’s apparent that the rough mix that was thrown down near the new curbs won’t last and has more gaps in it than a meth-head’s teeth. Loved seeing the picture of the old Broad Ripple rail. Great job Henry! I’m confused. Why does the red line have to block bidirectional traffic for (un)loading? It seems like design that works well for low public transportation traffic, but becomes an issue if it becomes popular. What’s the justification for that? Or am I missing something obvious here? I apologize, I didn’t study the project well. I guess one thought is that if the project becomes popular, it might reduce automobile traffic. Alternatively, maybe the “traffic jam” from a bus stopping there will entice people into just using the bus since they will be going the same speed as it anyway. Or more likely: Waze will send drivers onto quiet residential side streets at peak hours, as it does around the GW Bridge in North Jersey. On this topic, I remember seeing various promises of “traffic calming” in surrounding neighborhoods. Not exactly holding my breath here, but wondering if anyone has seen definitive plans? Only changes I’m aware of is on Central north of 38th, but those changes are a mixed bag and temporary anyway.